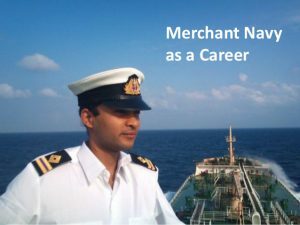 How to Ensure A Profitable And Productive Career In Merchant Navy? A profession in sea seems to be lucrative but offers certain challenging situations. There are myriad institutes in India which provide knowledge related to certain courses in Navy, but the best institution to impart this kind of knowledge is the maritime academy which provides the students with both theoretical and practical experience. The contemporary scenario offers plethora of options related to entrepreneurship and startups and various individuals are bent towards these opportunities without realizing the fact, that they are difficult as well as challenging. In terms of salaried professions, Merchant Navy offers rewarding prospects. You can travel the entire world, don a fancy uniform and call yourself as an officer. Did not think of entering Merchant Navy early in life? • Diploma in Nautical Science to be appointed as a navigation officer. These courses in earlier times were associated with different universities across India but now they have been clubbed under one umbrella as the maritime academy. This was a huge step by the Indian government in amalgating different courses under a particular standardization. This was initiated to remove discrepancies in relation to validity of particular courses. Therefore, due to lack of trained professionals, the industry demands manpower, especially due to the permanent nature of the shipping industry.You must be aware of the current status of the industry which mainly should determine your choice for admission. Employment is not as easy as it used to be which makes it imperative to be aware of job prospects before taking a huge step in your career.